This is a terrific time of the year for the gardener, as swathes of destruction c an be carried out without much fear of harming little seedlings or young plants. Happily, the process seems to be accompanied at the moment by warm sunshine. The mornings, when I inspect the moth trap in my pyjamas, may be chilly, but things have got nice and indeed almost toasty by mid-afternoon. 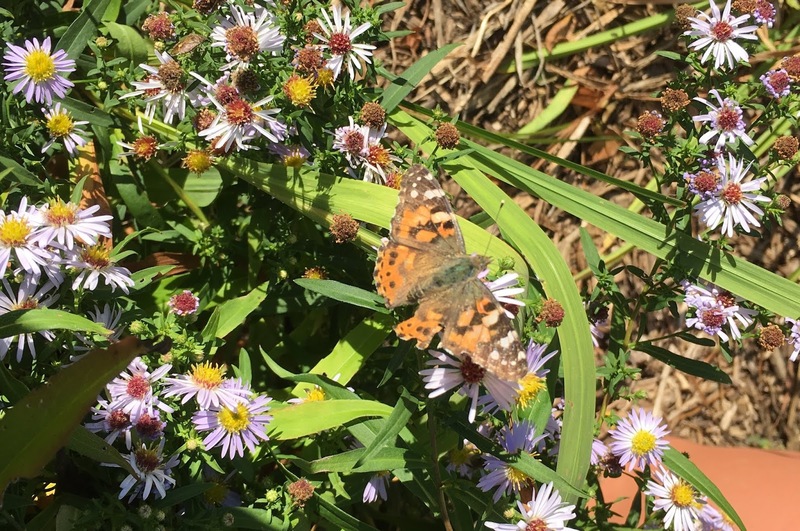 As a result, I carry in so far as I can, either my iPad Mini or P's iPhone to get a picture of any interesting aerial visitors. 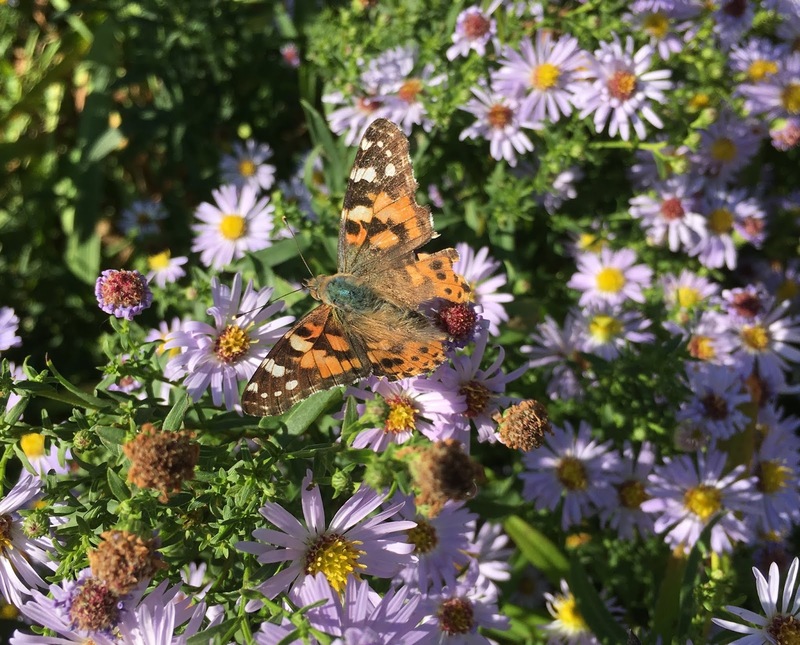 I missed the Hummingbird Hawk moth earlier in the week, but above is that marvellous Autumn visitor, the Red Admiral, and below, a veteran Painted Lady and a nice dragonfly. 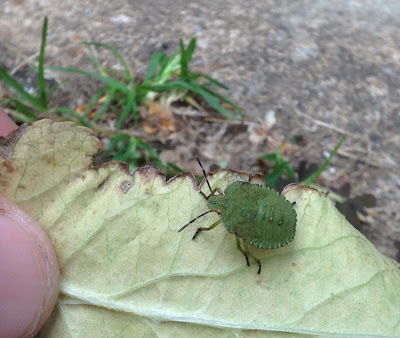 It is interesting that in all three cases, these insects took a very conservative view of their opportunities in our garden and the surrounding neighbourhood. The Red Admiral kept to a buddleia, the Painted Lady to Michaelmas daisies and the dragonfly to our garden furniture. 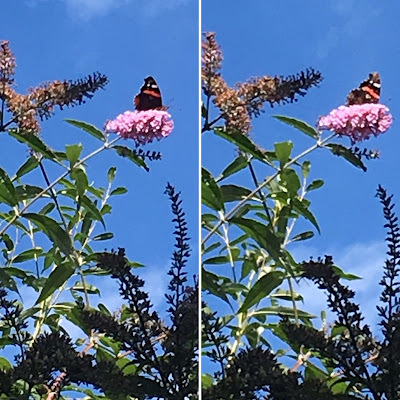 I heard the inevitable media doom extract on the radio the other morning about a drop in the numbers of some butterflies, including the Red Admiral. They added, but did not emphasise, that last year was a bumper one for such species. So it was (yet another) non-story; a matter for record but not for gloom. I completed my regular hawk moth tally for the year yesterday when I looked up from weeding and saw a Hummingbird Hawk moth nectaring on the small, bright blue flowers of a ceratostigma in the nearby flowerbed. 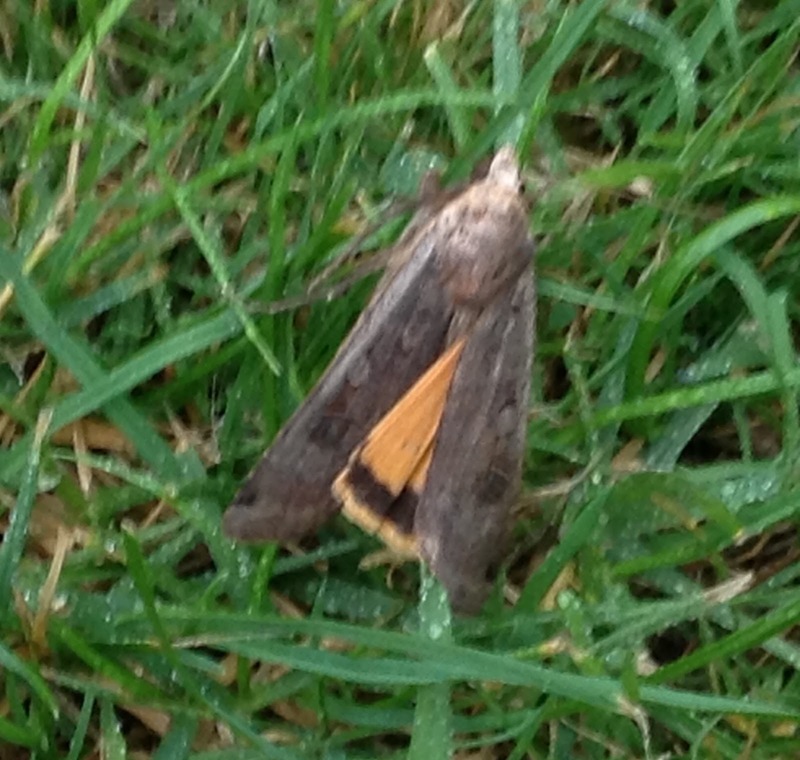 I zoomed in to get the iPad Mini and the moth was still hovering busily about when I got back. But not for long. As I fiddled in my usual inept way with the passcode and finding the camera option, it decided that it had had enough of our garden and whirred off before I could get a snap. Update: I should have added that my regular hawks are, in order of frequency: Poplar, Elephant, Eyed, Privet, Pine, Small Elephant, Lime and Hummingbird. I've seen Convolvulus in Cornwall and on photos taken by a neighbour's daughter in Tackley, just up the road from here. And also, memorably, Death's Head in Kirtlington, a couple of miles way. I thought that it had come back half-an-hour later, but the nectar-seeker this time was this lovely Small Copper butterfly, above. 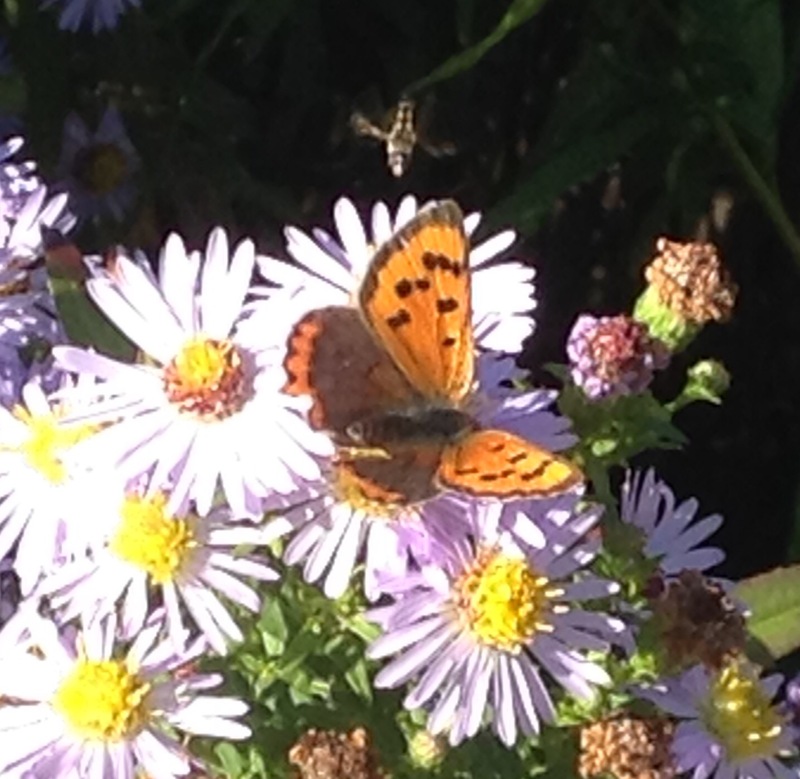 I didn't notice at the time but as you can see in the photo, it had competition for a drink from a small hoverfly. Rain all day today and I won't be putting the trap out tonight. But more, I hope, before long. 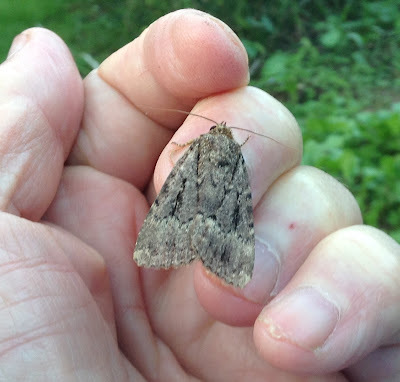 The moths have gently rebuked me for my rather grumpy observation in my last post that most of the arrivals at this time of the year are brown or grey. That is strictly true but just look at these exceptions which came the night before last: first of all, the delightful. bright orange-flecked Large Ranunculus. This specimen is a lot lighter than the others I've seen previously, not that it is a common visitor. 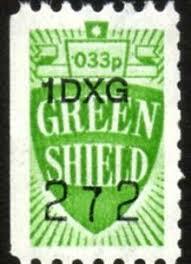 It came here in 2013 and 205 and never called when we lived in Leeds; it is classified as only locally found. 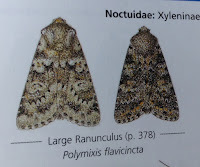 Richard Lewington's painting of it in the Moth Bible , pictured left, shows a much less vivid example as do most online sites. Continuing the orange theme, another resident of the eggboxes was this Orange Sallow in the first two pictures below, one of a large family of yellowy-orange moths which lighten up this time of the year. The third picture shows another of the seven species, the Sallow, whose colouring resembles the top of a creme brulee. Yum! . Below it is a Green-brindled Crescent, another bright spark whose browny-grey background is illuminated by the central area of metallic green wing scales. I also had another Old Lady visit, the third in a fortnight, and a lively Copper Underwing, shown below. 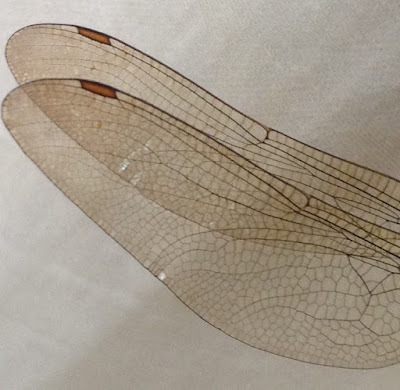 Meanwhile Penny the Ace Indoor Insect Spotter found these sad but interesting remains of a large dragonfly on the back folds of one of our dining room curtains. 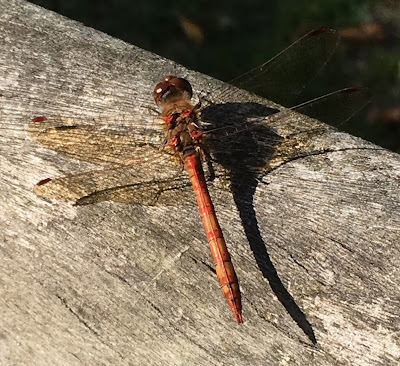 I was doing some long-overdue weeding in the vegetable patch yesterday when part of a tatty marigold stem which I was tugging appeared to move. 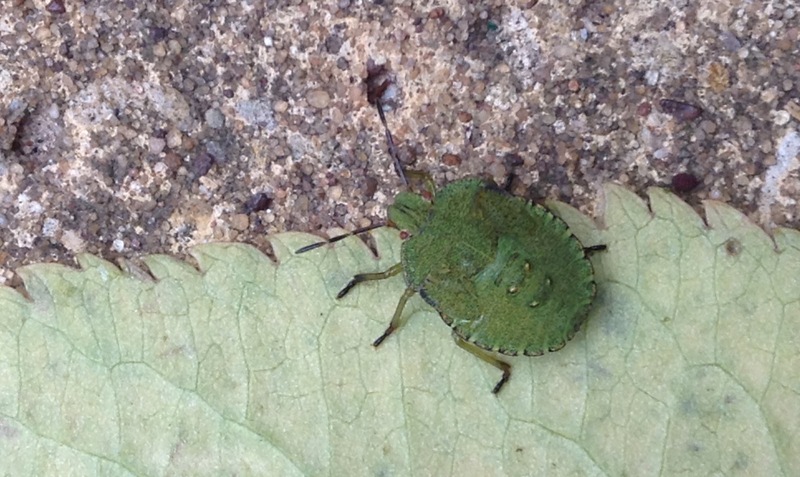 Then it definitely did move, and started scuttling off below the safety of a drought-impacted earth clod. 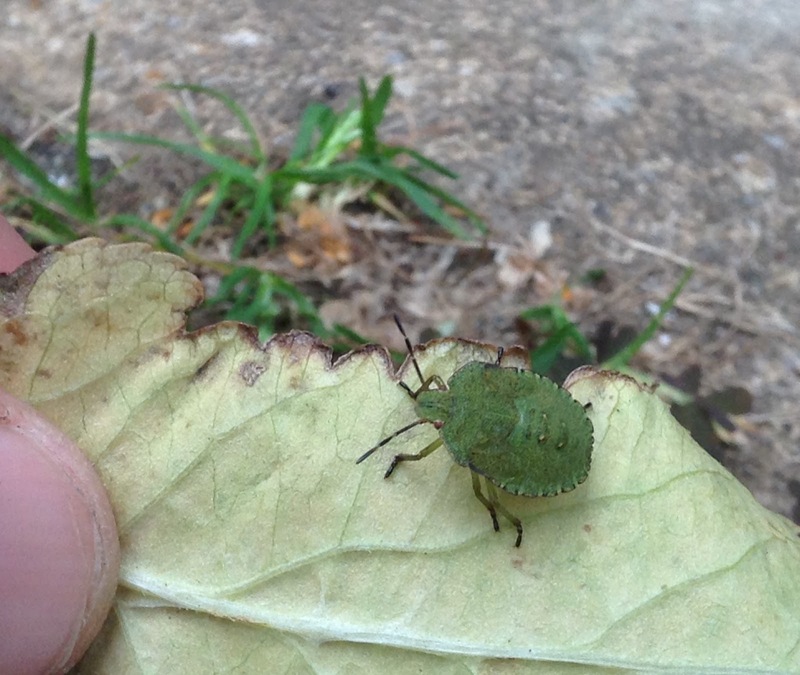 It wasn't really safe because I was in hot pursuit and managed to entice it on to a leaf for this photo-opportunity. 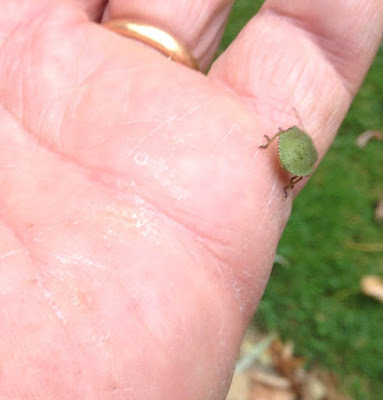 It is, I am pretty sure, the 5th instar - or life stage - of a Green Shield Bug, a garden visitor not always popular, especially with those who grow potatoes. It is an attractive little creature, though; not yet with the more angled and genuinely shield-shaped appearance of the adult. 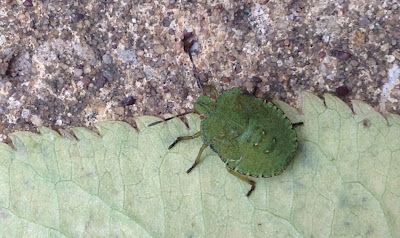 It is also common, like so many creatures which are unfamiliar to most of us in the UK; and it has the final attraction to people of my age of reminding me of Green Shield stamps. Do you remember collecting little books of these, each worth a fraction of a penny like a modern supermarket loyalty point, and then blueing the book, or several books, at a garage on something such as a Dinky toy? in the moth trap meanwhile, the tone is brown and grey, an unexciting time of the year unless you are lucky enough to be visited by one of the rare exotica such as the light blue/mauve-underwinged Clifden Nonpareil. Wonderful name! 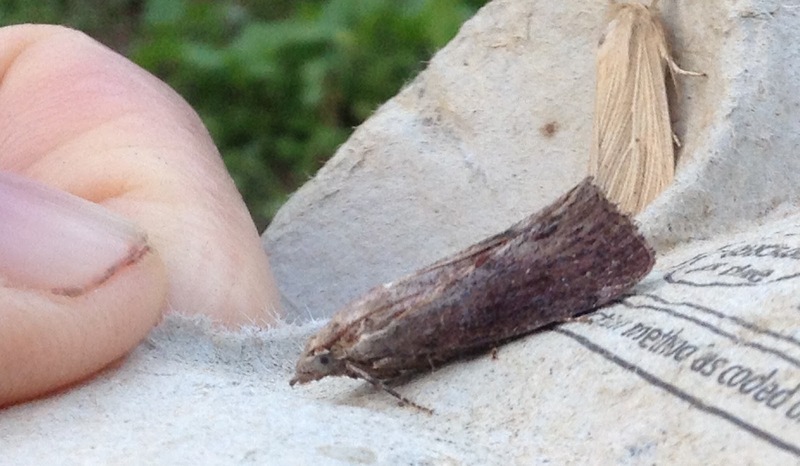 They keep turning up on the Upper Thames Moths blog and Buckinghamshire is clearly a good spot to see them. Since I recently rowed past Cliveden, after which they are named, perhaps it will be my turn soon. Above we have the delightful Frosted Orange, top left, and then proceeding clockwise, a Silver Y, a Black Rustic and a very tattered Old Lady. Below, a Willow Beauty shows off its camouflage expertise above two relatives which are not quite as well concealed. 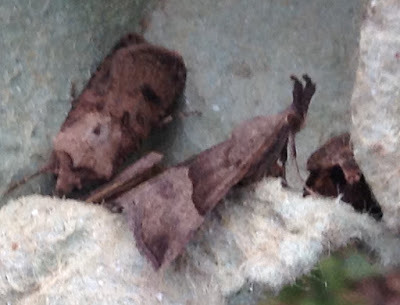 Finally a trio of typical visitors for this time of year which always send me to the Moths Bible or Hants Moths Flying Tonight, wishing that I had better ID skills. I think that they are an Ingrailed Clay, a Flounced Rustic and a Beaded Chestnut. Here's hoping. Hello all and apologies for the interruption in service while I carried out my sponsored row from Oxford to London. 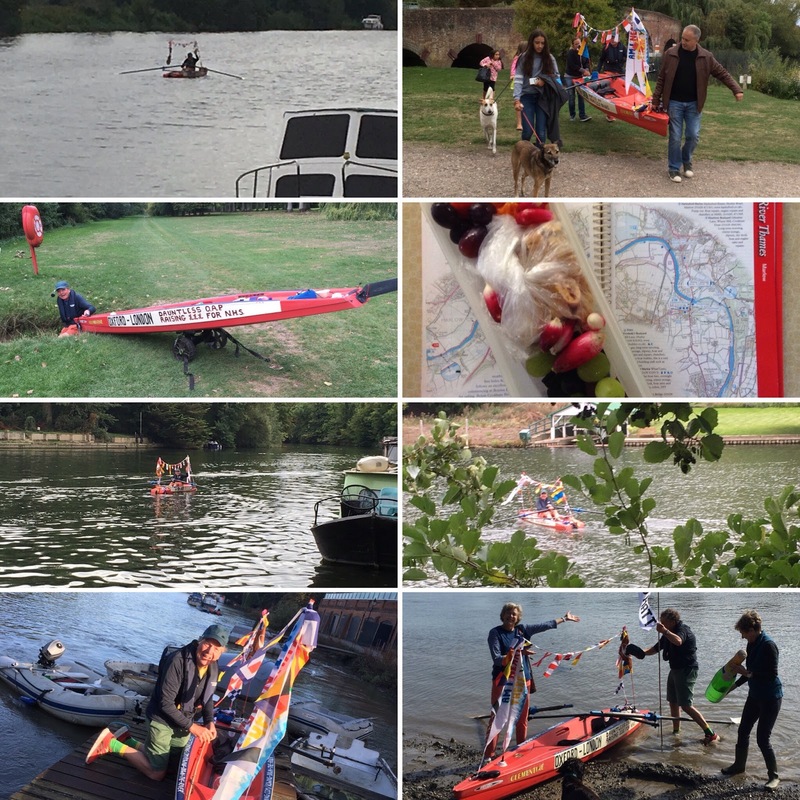 Thanks ever so much to everyone who has supported me and here are some pics. More can be found on the funding web page gogetfunding.com/rowing-down-the-river. 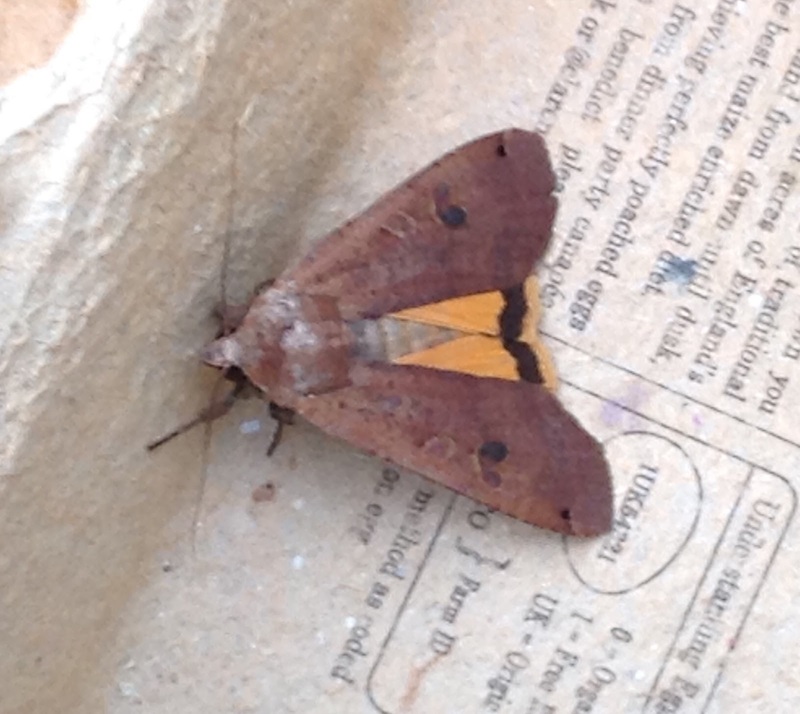 Back at home, I ran the moth trap last night and found one novelty, this attractive and quite large micro, Hypsopygia glaucinalis, perching on the classiest egg box (Burford Browns are lovely, with rich orangey-yellow yolks). 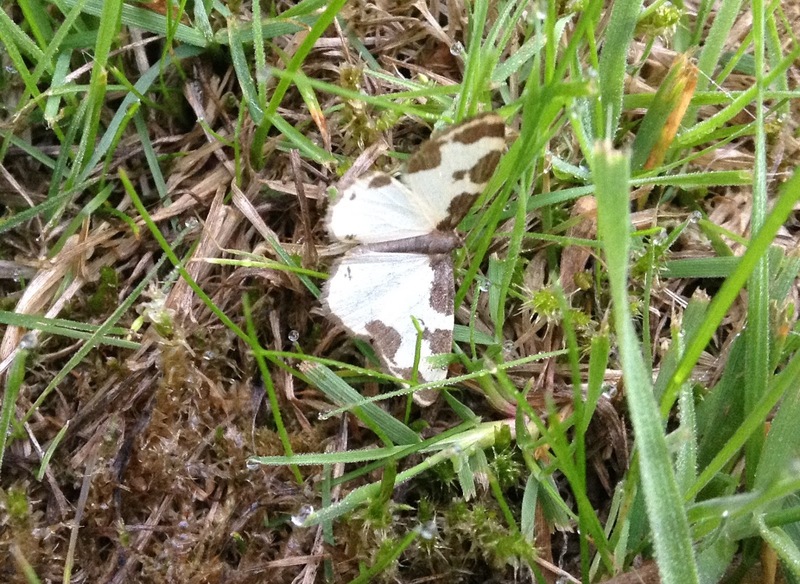 The moth has been here before on several occasions, always at this time of the year. It's a pleasure to welcome it again. There've been some complaints on the excellent Upper Thames Moths blog about Large Yellow Underwings being scarce this year. That isn't the case with me. 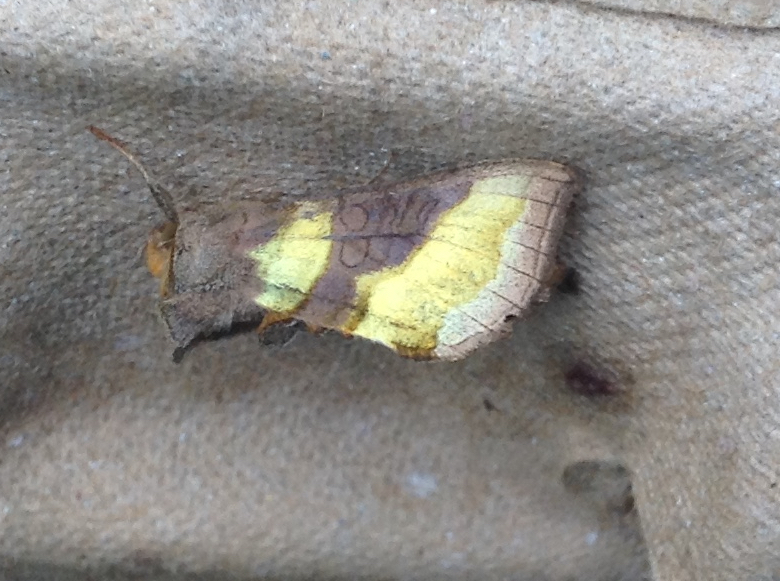 Not only are they abundant but last night's were more willing than usual to show their yellow petticoats which give the moths their name but are normally unseen. Mind you, the last one didn't have much choice in the matter since he or she was definitely dead. 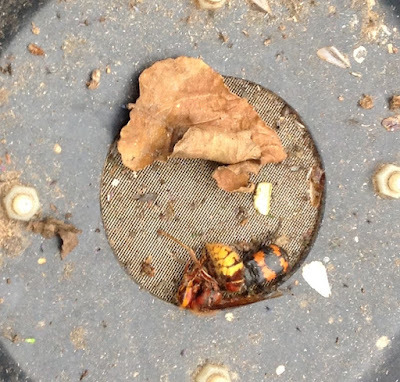 As were the hornet being shoved around by a red and black Burying Beetle, and some kind of moth, wasp or bee shown in a spider's larder in these two rather gruesome pictures which end my thoughts for today. In case you need reminding, this is what happens to a cream tea on a sunny afternoon in England. It wasn't ours, fortunately. The cafe was sensibly using one table for leftovers as a very effective decoy. 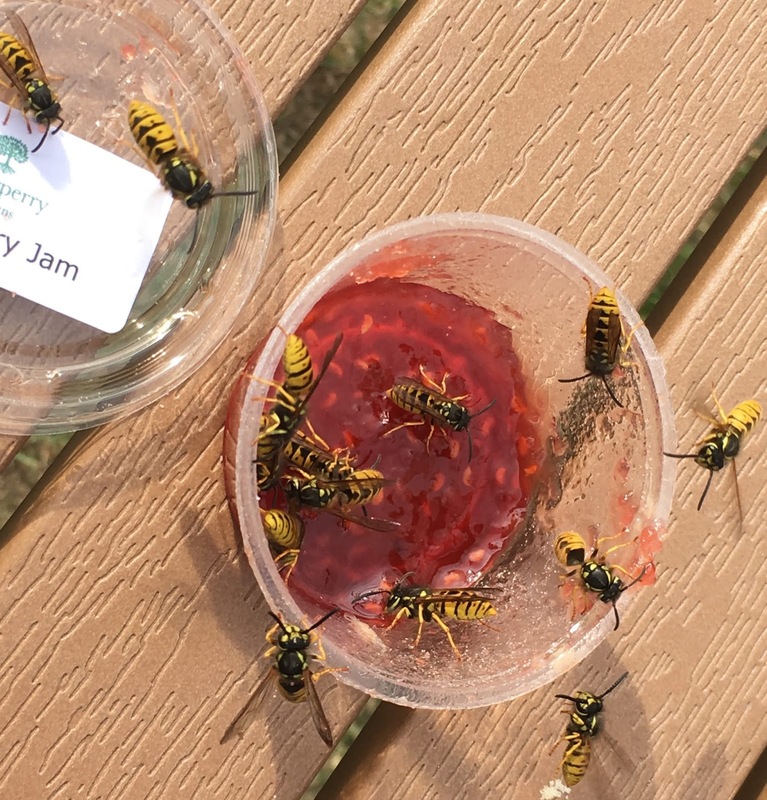 Not that I mind wasps, usually, and I find the range of variety of deterrents against them fascinating, ranging from sweet-water jars on the Ashmolean rooftop to a fake wasp's nest, like a black balloon, called the Waspinator. None are wholly effective but the battle is interesting for spectators. Things putter along quietly at the moth trap, meanwhile. Here's a Brimstone moth forming a nice colour contrast with my specimen-examining deckchair, below is that nice little moth a Lime-speck Pug (all the nicer for being distinctice unlike most of its Puggish brethren) and below that, another Brimstone with an Oak Hooktip, considerately snoozing on the transparent (though much-battered) cowl so that I can photograph them from above and below. 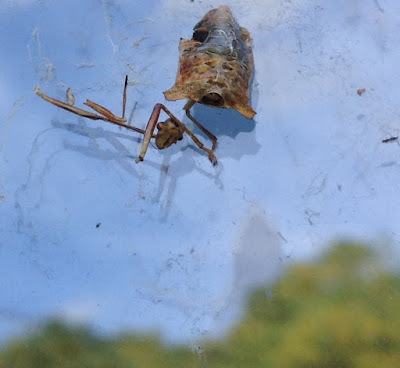 I did get a bit excited about this, however: a very curious extrusion from the little hole at the bottom of an eggbox cone. As you can see, the mystery proved to be sadly unmysterious. I am not suffering from the shortage of Large Yellow Underwings reported elsewhere. What else? 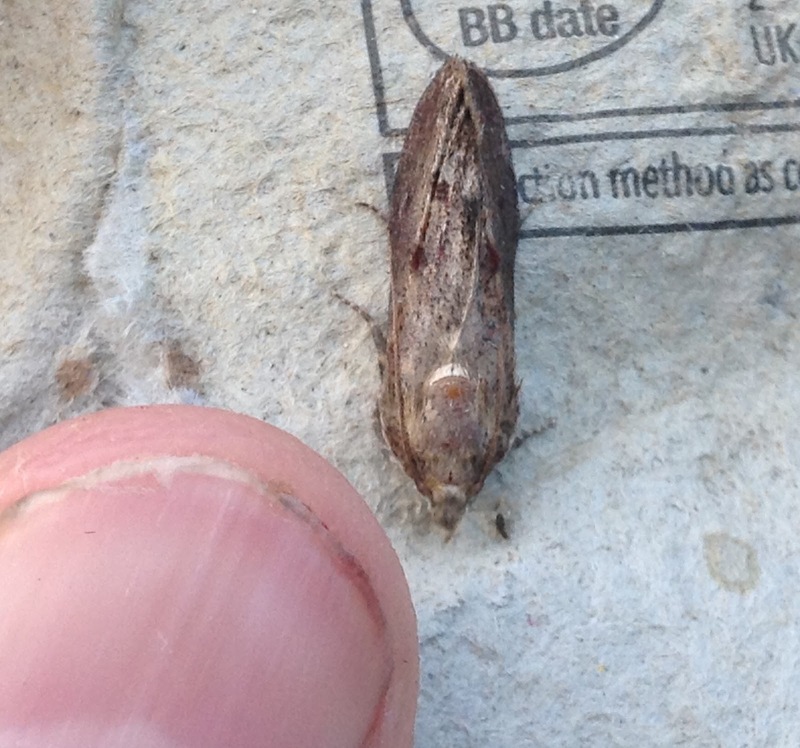 A nice Copper Underwing about to take off from my fingers, and the oversized Wax moth micro with its distinctive shape. 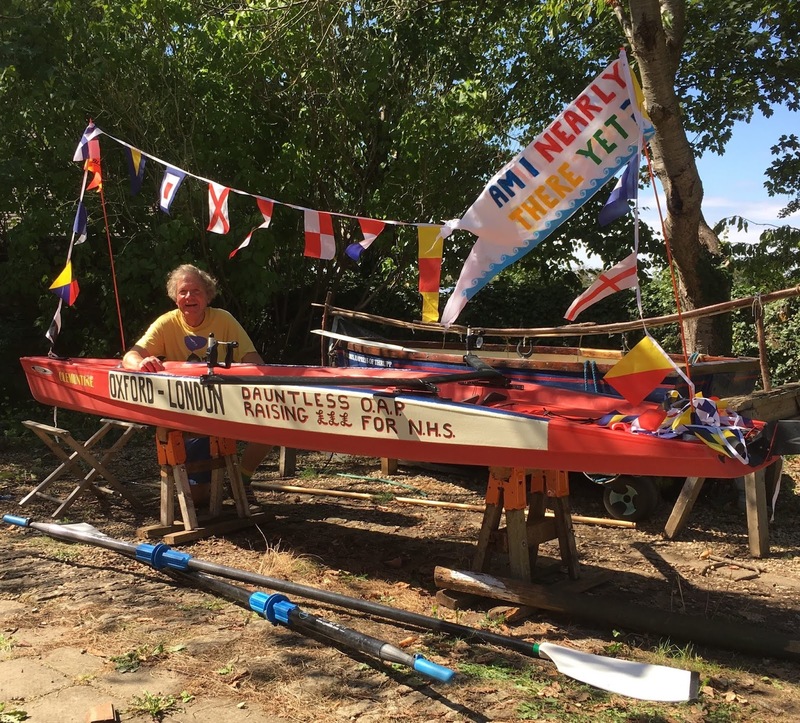 and ME, about to set off on my marathon row from Oxford to London to raise money for this. No more trapping for a week at least. Wish me luck! Pride of place this morning goes to a ladybird, not on its own merits pretty though it is, but because my iPad Mini came good for once with focus and colouring. I keep debating with myself and Penny about getting a new camera or perhaps an up-to-date iPhone. The camera quality of the latter is extraordinary. But for now, I plan to economise. Anyway, thank the Lord for ladybirds, even if like this one they tend increasingly to be the American Harlequin sort which is dominating our native species, much as happened with squirrels. Talking of mammals, here is a sad sight but one with interesting colouring. I am assuming that it is a shrew or mouse of some kind but whether the zebra effect is unusual, I do not know. I Googled the Mammal Society and via their website emailed the Oxfordshire county mammal recorder and now await news. The top moth in my next picture is the pretty but familiar micro Pyrausta purpuralis, a species which surprisingly has never acquired a familiar English name in spite of its distinctive appearance and vivid colouring. The large micro below it is meanwhile more interesting than I thought. At first glance, I assumed that it was that regular visitor the Garden Pebble but a post and picture on the brilliant Upper Thames Moths blog by Richard Ellis shows me that it is a European Corn-borer, not the nicest of names but only locally common and new to my garden list. Apparently they are having a good year. Still in microland, the distinctive paper-dart moth beside the Setaceous Hebrew Character in the picture below evades my ID skills for the time being but I will persevere. The second, very poor quality pictures, show it from either side. 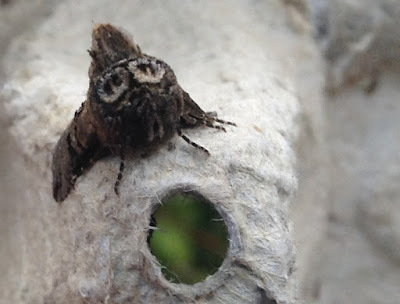 Three old favourites next: the sweet little Spectacled Moth with its false giglamps, a Burnished Brass form aurea and a blurry pic of a Snout moth, showing the reason for its name. 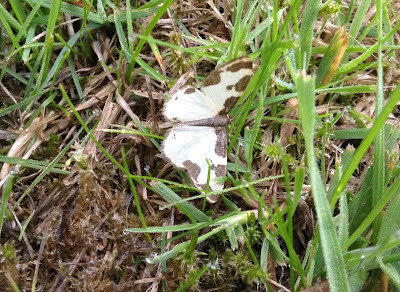 And to finish up with, here's a pretty Clouded Border which disdained the trap, preferring the lawn; and the beautiful creamy-brown form of the Large Yellow Underwing. 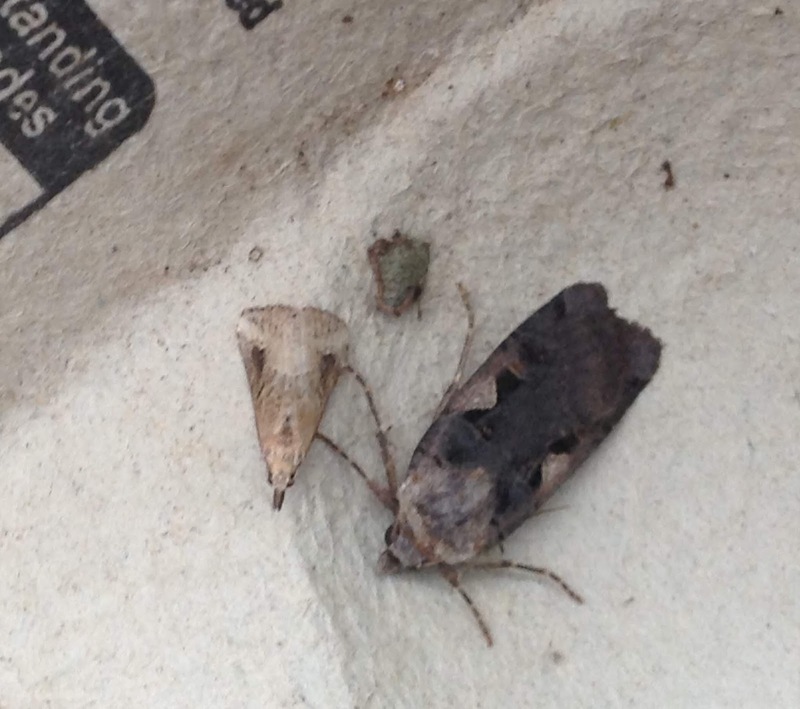 There has been some concern on the Upper Thames Moths blog about LYU numbers but there are plenty here.